While on mission in Washington, D.C., PCAAE’s CEO and founder, Octavio B. Peralta, visited the headquarters of BoardSource, a non-profit membership organization whose purpose is to inspire and support excellence in non-profit governance and board and staff leadership. 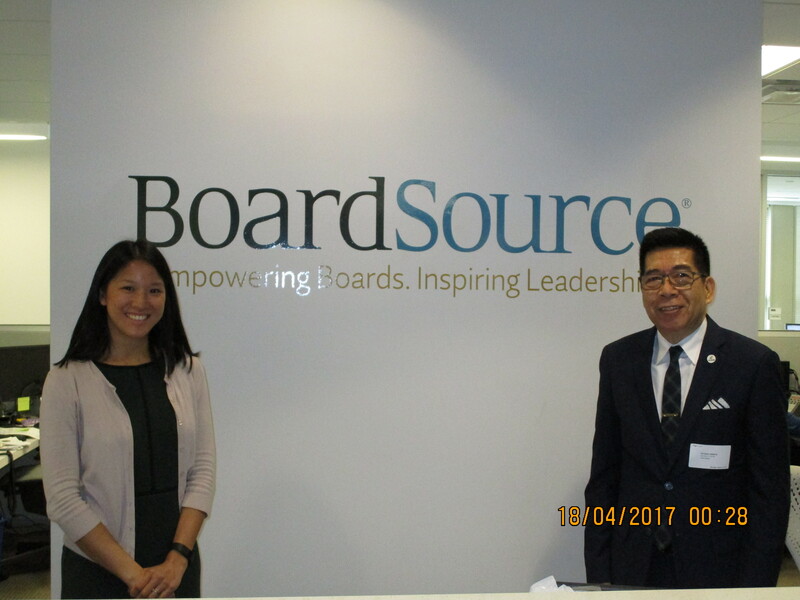 He met with Ms. Boosaba Tantisunthorn, Manager of BoardSource’s Strategic Development and Partnerships. Since one of PCAAE’s advocacies is to strengthen association governance in the country, the visit provided potential collaboration ideas in terms of online board leadership training courses, publications, and other educational resources. With nearly 30 years of hands-on experience working with non-profit boards, BoardSource has become the “go-to resource” for non-profit organizations as it engages and supports a global network of non-profit leaders and institutions as well as offers a wide range of resources to strengthen board performance. BoardSource https://boardsource.org/ works in partnership with individuals and organizations that share the common belief in the power of non-profit organizations and leaders to advance the public good and that are working to create positive change in their communities and the world more broadly.